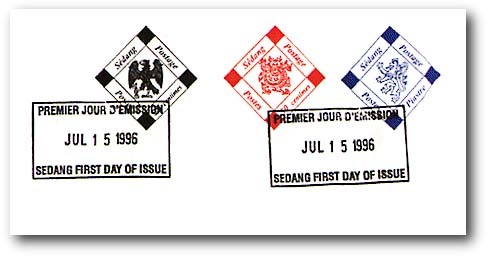 Day of Issue: July 15, 1996, at the Chancellery of Sedang, Toronto, Canada. 50 centimes (red): Chinese dragon, symbol of the emperors of China and Vietnam. 1 piastre (blue): gold lion rampant wearing an Eastern coronet (from the new coat of arms of Sedang; based on the original coat of arms of 1888). The stamps were offset printed in sheets of 35 with two marginal inscriptions per sheet. All stamps are imperforate. First day covers were made with either a special rectangular “First Day of Issue” cancellation or a red circular date cancellation. Please quote issue code (9601) when ordering. Dealers' and agencies' inquiries welcome. This website was last modified on Tuesday, March 02, 1999.